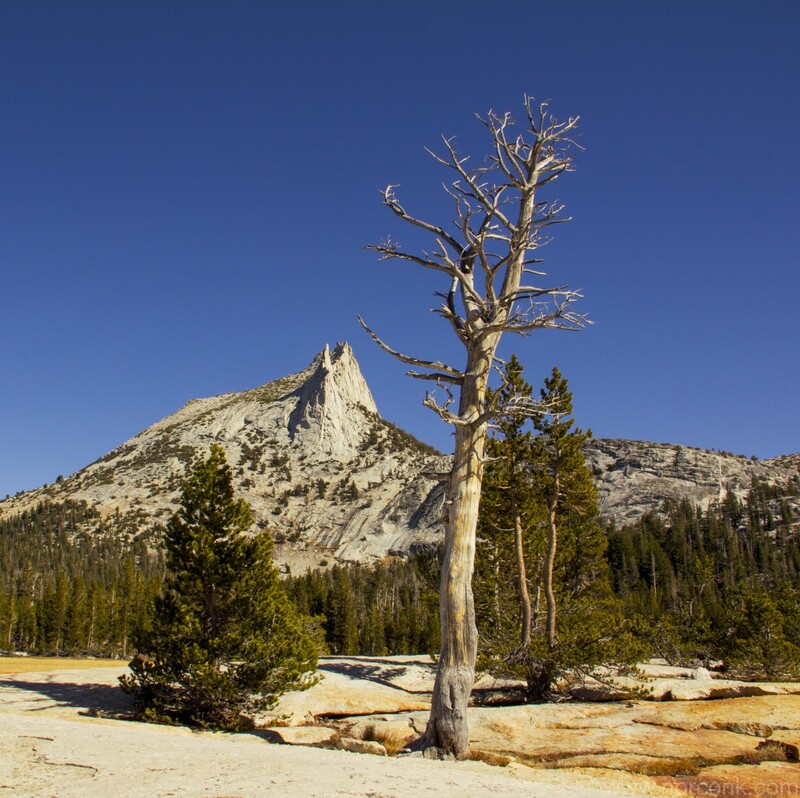 Cathedral Peak in Yosemite National Park, looking away from the lake. Oh, and a dead tree in the foreground. It would have been cool to hike around the lake and get a shot of the peak with the lake in the background. It would also have been cool to realize that “Cathedral Lakes” is plural and that there were two lakes, though I think the other is far less grand. 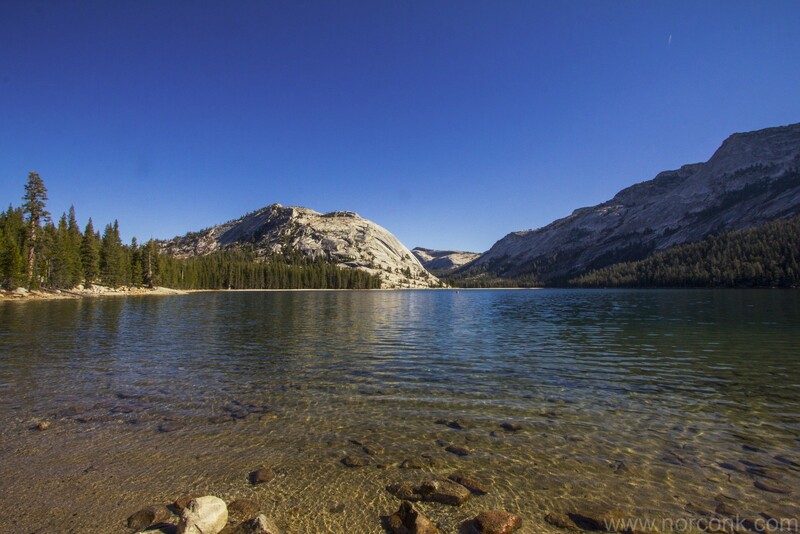 Tenaya Lake in Yosemite National Park – not quite as beautiful as Crater Lake or as the Cathedral Lakes we were en route to, but still worth a stop along the way. * I updated this picture after it originally posted because the original had a horrible yellow cast to it that made me sad. Sunset in Yosemite National Park – similar to one I posted long ago, but the a wider angle showing the trees. That said, I’m not completely fond of the look that the foreground trees took on in this HDR rendition, but the HDR was a must really to get the trees to show up at all. 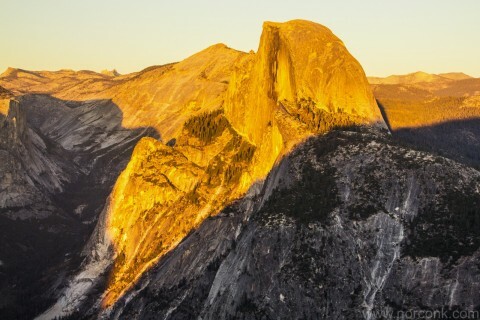 Here’s a second shot of Half Dome taken at Sunset on our first day in Yosemite taken from Glacier Point. I believe there was a hike that we could have done ending at the point, but we had been doing other things throughout the day, so we just drove up there. As pointed out on the National Park site, this is a very popular viewpoint and the parking lot was full for sunset viewing. I have this picture taken with both a wider and narrower field of view, but I think this one is the best framing. Just enough of the surrounding landscape to show how Half Dome towers over Yosemite Valley, but not enough that it’s relegated to being part of the backdrop. I’ve posted one similar to this before, but it was not this one, so I’m not breaking my rules. Of course, in some cases that means I could post what appeared to be the same picture for a month straight without truly repeating. 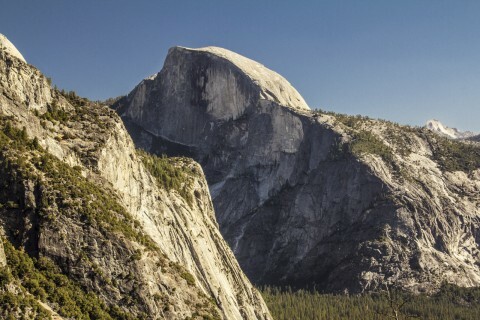 This is a shot of Half Dome in Yosemite National Park, taken from the Lower Yosemite Falls trail (I think). It started out with a strong bluish haze over everything since it was taken at quite a distance and later in the day. Took a lot of doing to adjust it to the point where it was something really worth viewing. We stayed in Yosemite for a second night (probably because I’m cheap and the camping didn’t cost much). 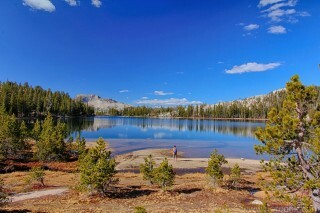 Day two, after packing up, we went to find the Cathedral Lakes. It was about a 45 minute drive to get there, all inside the park, which is of course, huge. We stopped off at a side-lake on the way, though I can’t remember the name any longer. And, just now, upon looking up the link, I realize that we completely failed to hike the extra .5 miles to Upper Cathedral Lake… seems like the plural in the hike name would have been a hint. Oh well, we’ll have to go back. Between the drive and the hike, this took most of the day. We got back to the visitor center area just before sunset, shot a few pictures and stopped in the store for souvenirs before heading out. So, San Francisco Day 3, happened quite a way out of San Francisco in Yosemite Valley. We drove out to the North, across some other large bridges which are not nearly as famous as the Golden Gate. 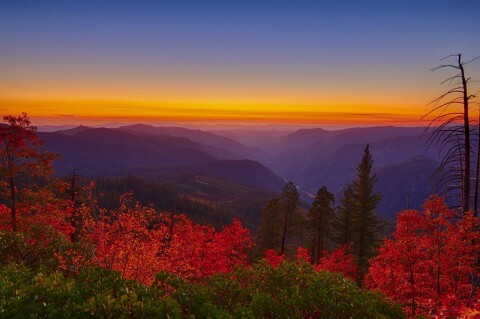 We drove the three or four hours out to Yosemite National Park – getting there sometime after they had more or less closed down for the day. We had reserved a camp site, so we just proceeded there to setup camp for the night. 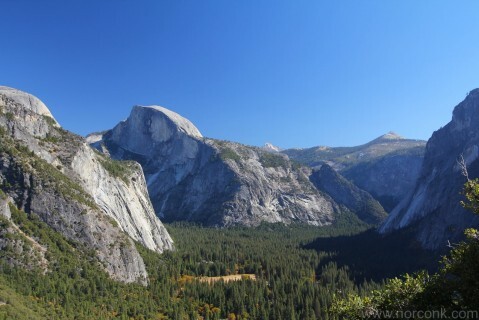 The view of Half Dome from the valley overlook point.